Since 2016, TWAEA has been organizing international institutional management and research delegation tours each year. This year, the delegation continued its efforts and made a visit to several universities in Kanto region of Japan. The six highly acclaimed and outstanding universities visited in Tokyo, Japan includes University of Tsukuba, Toyo University, Kanda University of International Studies, Chiba Institute of Technology, Sophia University, and Tokyo University. 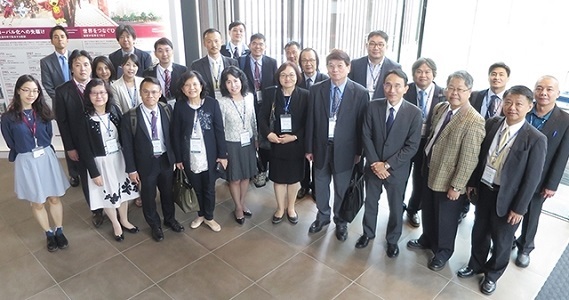 In addition, Education Section Chief at Taipei Economic and Cultural Representative Office in Japan, Mr. Shi-Ying Lin, also met with the academic delegation from Taiwan for further exchanges. Over the five-day visit, the delegation had the honor to listen to the speech given at the University of Tsukuba by Dr. Kaneko Motohisa, Councilor at the Central Council for Education of Japan's Ministry of Education, Culture, Sports, Science and Technology (MEXT), who was also a professor at the University of Tsukuba, as well as the speech given by Professor Tokunaga Tamotsu, who was former Director General of the Department of Higher Education at MEXT and former Vice Principal at the University of Tsukuba. In addition to learning more about the current status of Japan's higher education development and institutional management practice, the delegation also has the opportunity to visit these highly distinctive universities.